In celebration of manufacturing, M’s Machine & Mfg. in conjunction with another local manufacturer (and customer) held a MFG Day event October 6th, 2017. Together we hosted over 200 high school students from 6 different area schools. 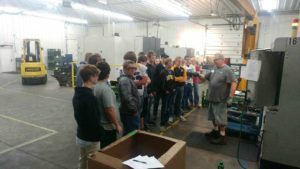 Students were able to tour both our facility and our customer’s facility alternately in order to get a visual of what a machine shop is and who the customers are that we serve. 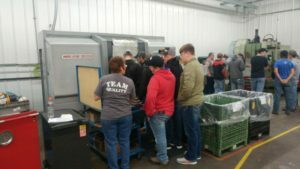 Students saw various manufacturing demonstrations including , plasma cutting, CNC machining, welding and painting, as well as received hands on experience with various types of measurement equipment. Students were given an idea of what it takes to become a machinists and made aware of various opportunities waiting for them in the manufacturing industry. M’s Machine works with local area schools and community colleges to provide a larger hands on experience through job shadowing.
) with any questions they may have regarding opportunities in manufacturing. Monona, June 5, 2017-Candace Drahn and Casey Drahn co-owners of family business, M’s Machine & Mfg., were given the opportunity to show their business to Anchor, Chris Earl. The morning Anchor for KCRG TV9 contacted the company to be featured in his “Made in Eastern Iowa” segment. During the visit Candace and Casey were able to discuss a couple of topics currently challenging their business. Finding quality employees now and in the future and their recent struggles with the downturn in the Ag sector. As well as exciting advances in technology which has changed the way they do business. Much like other manufacturers in Northeast Iowa, M’s Machine’s business is predominately Ag related. When the Ag sector takes a hit so does their business. Candace tells Chris about recent goals to better diversify their customer base which has allowed the company to come out of the latest Ag downturn stronger than before. It was not long before the company saw the shift of needing more business to needing more employees. Finding quality employees in a small community with low unemployment is tough. Therefore, management at M’s Machine realizes the importance of educating people about manufacturing today and careers available within this sector. They do this by holding an MFG Day event and by working with local high schools and area community colleges. The company allows interested students an opportunity to job shadow at their facility. All of which is designed to enlighten the community about manufacturing jobs today. Jobs in manufacturing are not the same now as they were 20 years ago. Facilities are clean and full of ever-changing technology which continuously enhances the way company’s like M’s Machine does business. If you missed the segment featuring M’s Machine, aired on June 5th, 2017 follow the link below to watch. Monona, March 21, 2017-After several months of hard work, M’s Machine & Mfg. Co., Inc. management and employees have successfully obtained certification to the ISO 9001:2015 standard. ISO 9001 is the international standard that specifies requirements for a quality management system. (ASQ.org) Notable changes in the 2015 standard include a new clause numbering system, change of emphasis on documentation and increased emphasis on both leadership responsibilities and management of risk and opportunities. With the release of the new standard, company management made the decision to reassess the current quality program. As a result, the Quality Management System (QMS) is better aligned with the company’s overall strategic direction. The integration of the QMS with the business and business planning brings a sense of teamwork and unification to the environment at M’s Machine. In preparation of the new standard the staff at M’s Machine participated in several hours of training, including training for the internal audit-team who is responsible for verifying that the QMS is being followed and is in line with the ISO standard. The team at M’s Machine, through hard work and training, put together a great program that will continue to lead the company in achieving their goals of customer satisfaction for years to come. Welcome to the blog of M’s Machine & Manufacturing Co., Inc. Visit this page for stories about how we work with OEM supply chains to provide seamless service and low cost CNC parts. We’ll also post photos and videos that demonstrate our quality workmanship on metals, stainless steel, aluminum and plastic materials for OEMs across various industries. Please solve this simple math problem to prove you're not a robot!